In the latest DLC Dark Brotherhood for The Elder Scrolls Online, you can acquire additional skill points with Sky Shards. For every three sky shards you gather you get one skill point. Along the new area, the Gold Coast, you can find a lot of new sky shards. However, sometimes it can take hours to find enough Sky Shards. Therefore, in our guide we show you where you can find all Sky Shards in Dark Brother. These special items can be found in dungeons and towers, in forests and mountains. Since the Gold Coast makes no difference. There are a total of six sky shards can be found in the new field in Dark Brotherhood. 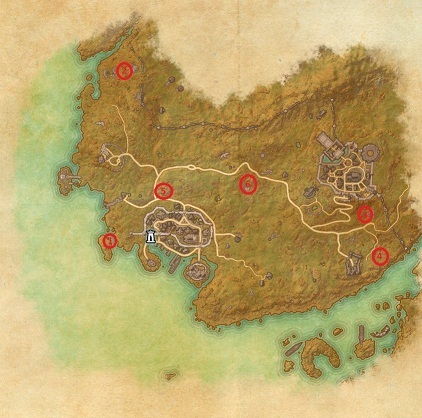 We have compiled a list for you and create a map on which all locations are marked. The Sky Shard is located on an isolated island in the South-west of the Gold Coast. Rely Anvil westward to bypass the deep water and then come to the island. Go until you come to a cemetery, which is the final resting place for knight in the north on Anvil. Behind it is a crafting station and the sky shard lies between these two locations. Near the eastern watchtower you can find the third Sky Shard. In the south of Kavatch major settlement next to an old tower you can find another Sky Shard. On a quiet little hamlet you have a field, look out. The Sky Shard is guarded by two lightning bugs. Defeat them and take the Sky Shard. You must go the Hrota cave. There search in the water and you will find the Sky Shard. You can find the last Sky Shard in Garlas Agea. Behind the entrance you have to go to the first room and turn to the right. There you will find the last shard.